As so famously documented in a brilliant article in Sports Illustrated (back when a brazillion men read it) and followed by hundreds of thousands of fans over the years, the Worrell 1000 was one of America’s most iconic races. It was 1000 miles (or quite a bit more, at times) of bone-crushing, soul-bruising beach cat sailing, surf-launching, and high-speed crash-landing along the Atlantic Coast, with tons of old legends and unknown-but-now-familiar names showing their sack and insanity. 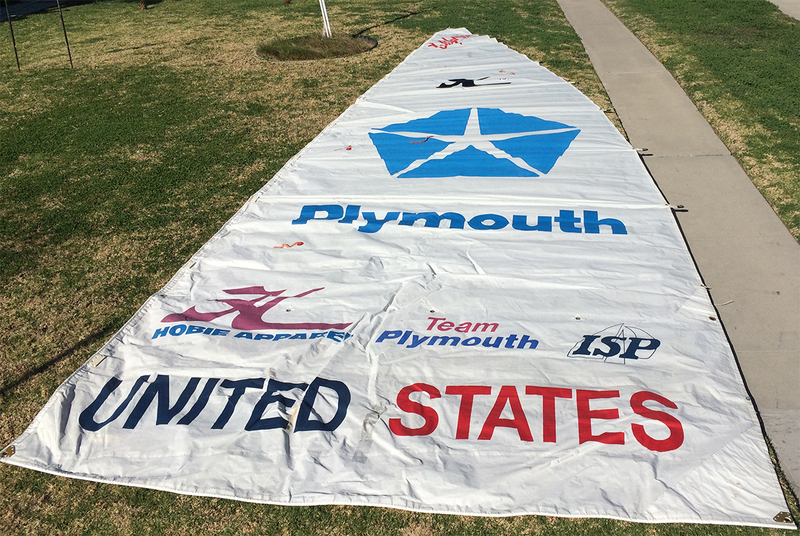 I still have this Hobie 16 mainsail from the 1983 Worrell 1000. My dear friend Carlton Tucker was one of the team members along with Hobie [Alter, -ed] Junior and Miles Wood. The sail is in great shape. Pretty amazing for a sail that is more than 32 years old…The format used that year was non stop round the clock racing alternating team members at each stop. Brutal. Share your Worrell 1000 memories here.